I love Alice Peterson’s books – what more can I say? I have never yet been disappointed by any of her books and each time I read the next one I can’t believe that it will exceed my enjoyment of the last – but it always does. Which is why I am heartily declaring One Step Closer to You as my favourite read of the year so far. 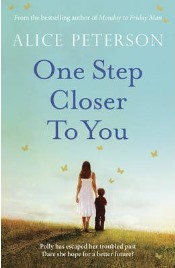 One Step Closer to You tells the story of Polly Stephens, a recovering alcoholic, and her young son, Louis. She has managed to put her troubled childhood and an abusive relationship behind her and is now a good mother to her son and also enjoys her job working in a local bakery. She still needs the support of her sponsor and her weekly AA meetings though and at one of these meetings she is surprised to see a fellow parent, Ben, from the school that Louis attends. Ben is not actually Emily’s father but her uncle; his sister Grace died suddenly and he took over the care of his grieving niece with little idea about how to bring up a young child. He and Polly are drawn to each other and find that they can start to help each other in the care of their two young children. All their friends think that there must be more to their relationship but both insist that they are just good friends. Could it be possible that they mean more to each other though, and if that is the case, is either of them brave enough to risk the friendship that they have? I hope that I have said enough to entice you to pick up this wonderful book and start reading; I promise that you won’t be disappointed. It is a completely absorbing read from the very first page that will draw you in and make you want to keep you reading to the very last page. You will enjoy getting to know the main characters and, if you are like me, you will start to care about them. Overall, One Step Closer to You is a wonderfully poignant story. As with all of her books, Alice Peterson writes in a beautifully compelling way. This is a book that will make you laugh and it will make you cry, but ultimately it will leave you wanting more and you definitely won’t want it to end. This is another excellent book from Alice Peterson. I thoroughly recommend that you read it, and if you have not read anything else from this wonderful author, you have a host of fabulous reading to look forward to. With thanks to the publisher for sending a review copy. No Comments on "One Step Closer to You"